Due to ever more compact and efficient engines, which also have to meet stricter and stricter environmental requirements, the risk of fire is increasing. As a result of protecfire‘s consistent development of the extinguishing technology for machine and engine protection that was proven reliable and approved for use in the mining industry, the new and peerless detexline (detection – extinguishing) has been designed. With this patented system, the extinguishing and pilot function are carried out over just one line. In addition to saving on material and mounting, this solution takes up less space in the object it protects and can be optimally integrated. Disturbing components are a thing of the past. In thermal terms, the engine compartment is not a homogenous area. Different temperature zones make differentiated temperature detection necessary. High temperatures which are tolerable in the area around the exhaust system could pose a potential fire hazard around electronic components. For this reason protecfire has determined different temperature zones for the detection and has thermally categorized the fire detection elements according to their temperature profile (79, 93 ……260°C). 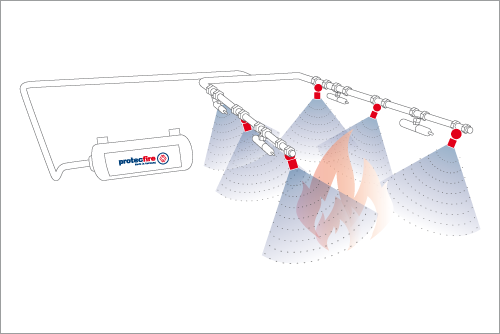 protecfire does not require an external power source for the detection and extinguishing. The system is self-contained and depressurized in operational mode. Due to the fine spay nozzles which we developed in-house, it is possible to achieve an optimal extinguishing result without high pressure. Right from the start, protecfire‘s aim in designing the system was to develop and combine components in an intelligent way. During this development, the one-line system for detection and extinguishing, detexline, was created. With the fine-spray nozzles developed by protecfire, a comparatively small amount of extinguishing agent can create an enormous reaction surface of extinguishing water droplets, which rapidly lowers the fire‘s energy and also causes a significant decline in temperature. In this way, the fire source‘s thermal reaction conditions are blocked. When the fire is extinguished, the extinguishing agent forms a sealing film over the components and so prevents any reignition. Looking for Plumbing & Sanitary Services? Looking for Fire Safety Products? Looking for Fire Safety Regulations?